Hello From the Kansas City area!! Re: Hello From the Kansas City area!! Well thanks for that catfish info. I love it fried. The storebought models we get down here tend to be more long and narrow with a notch cut out where the guts and surrounding bones has been trimmed out. I never met but one dumb Texan who even claim to know how to propaly fillet one. He was an old Perch Pimp..aka Rabbit Sheriff..aka Game Warden. It still looked real lumpy. Now was them steaks from Omaha Steaks by any chance? Reason for axing is I cooked some just the other night which looked just like that. Both the fish and the pork chops came from my local grocery store. Welcome from the So Cal area! We like the picts. Thank you for the fine welcome!! Since you all like pics so much........I'll give you all a good laugh. My grill has never seen sunlight....REALLY! I wasn't kidding when I said I grilled inside. I can honestly say I don't worry if it rains or snows with regard to grilling. The above is my grilling "manspace"......a section of my garage is reserved for fire. Is that one huge telescope in the back? This guy is gonna fit right in! First post has pictures!!!! Welcome to the jungle! yea....one of my hobbies is astronomy. There are 2 telescopes there....... the little one with the trash bag dust cover has an 8" mirror. 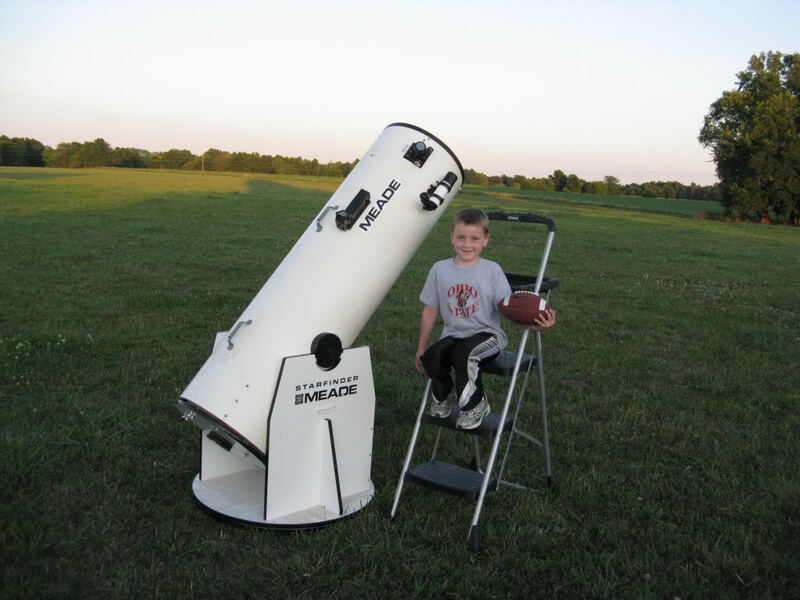 (use that in the yard) The biggie is a 16".......I load it in the SUV and travel to dark skies on new moon weekends when the weather cooperates. My 8yr old son loves looking through them too .....for just being 8, he's seen a lot of really cool stuff. My astronomy aptitude is much higher than it is for grilling. Hahaha, but I'm looking to work on that!! They start to get over it when they taste some goooood cooking! Thanks...yep, raising him right We've lived in Big12 country for 11yrs now.....so he's never even lived in Ohio..LOL When he gets older, kids will be calling him a bandwagon fan. Haahahahaha......but the truth is my good upbringing.